Did you know AJW offer a complete range of roofing & cladding products? Contact your local AJW depot for prices and further details. Our Spring Promotion focuses on four key product areas including ALM Lead, Cedral fibre cement weatherboard, FreeFoam Plastics and Ariels, Coroline, Onduline and Vistalux. Through-out the promotion we’ll have lots of special offers, supplier days, competitions and more. 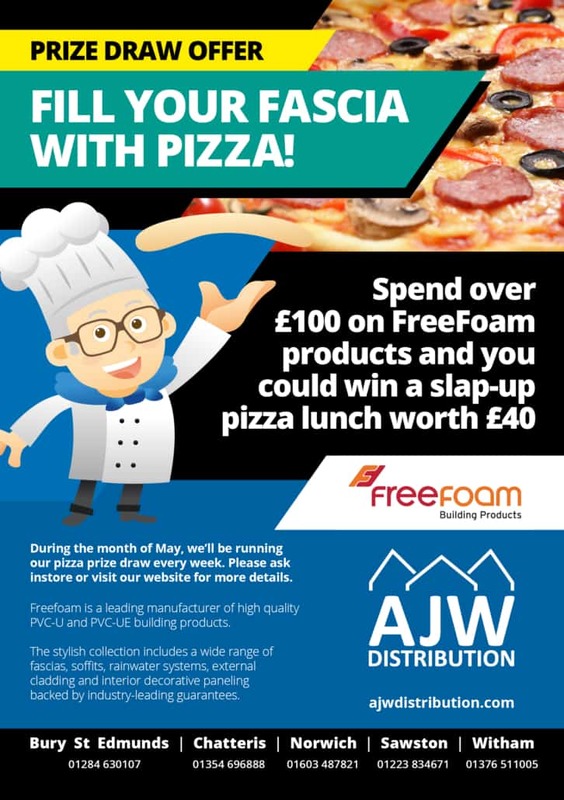 Visit your local AJW branch for their ‘Supplier Day’ to find out more about our ‘Spring Promotion’ products. Each supplier will be showcasing their products on the day, giving away goodies and we will be running some games during these events. Keep an eye out in our depots and on our social media accounts for more details. Fibre cement Cedral Lap weatherboard external cladding is the ideal low rot free alternative to traditional timber weatherboarding. With the visual appeal of natural timber, the simplicity of installation and resistance to rot, Cedral Lap weatherboard is an attractive, low maintenance alternative to PVCu cladding or timber. Cedral Lap weatherboard can be supplied in a range of 23 factory applied solid colours – providing an aesthetic option to suit many project requirements. Building on 50 years industry experience, Ariel Plastics continues to evolve and grow it’s own product portfolio to deliver a range of products that lead the market in performance, price and innovation. Coroline corrugated bitumen sheet is tough lightweight roofing and cladding material made from bitumen organic fibres giving the following features – Economical / Resilient / Environmentally Friendly / Guaranteed waterproofing for 15 years / simple fo fix / High Insulation and sound absorbency values / Compatiyablewith most commercially available construction materials, The thickness of this is 2.6mm. Onduline is a tough corrugated roofing material manufactured with bitumen saturated organic fibres under intense pressure and heat. It has a thickness of 3mm and is available in four colours; black, brown, red and green. Ideal for sheds, garages, stables and agricultural buildings. Vistaluz is an ideal PVC sheet to be used for roofing and cladding. Which could include porches, carports, canopies, roof lights, side cladding, covered walkways, garden sheds and lean-to extentions. ALM are one of the leading distributors of lead in the UK construction market. ALM Rolled Lead is available in standard cut widths for lead flashing along with wider widths for roofing and cladding. Lead has been commonly used for thousands of year as its presence is widespread, easy to extract, easy to work with, its malleable as well as easy to smelt. ALM rolled lead is available in Codes 3/4/5/6/7/8. The codes relate to the thickness of the metal which can heavily affect the performance and installed weight. We offer all ALM ancillaries which are best to be purchased with ALM lead; including fixing clips, sealent and patination oil. 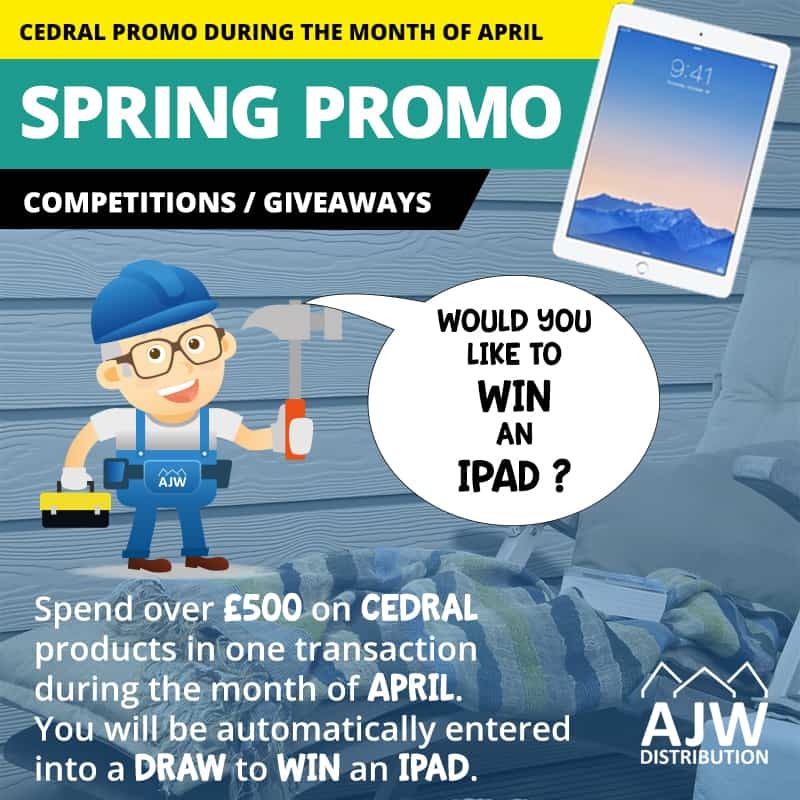 For APRIL ONLY: Spend over £500 in one transaction on Cedral products in any of our depots during the month of APRIL and you will be automatically entered into a draw to win an iPad. 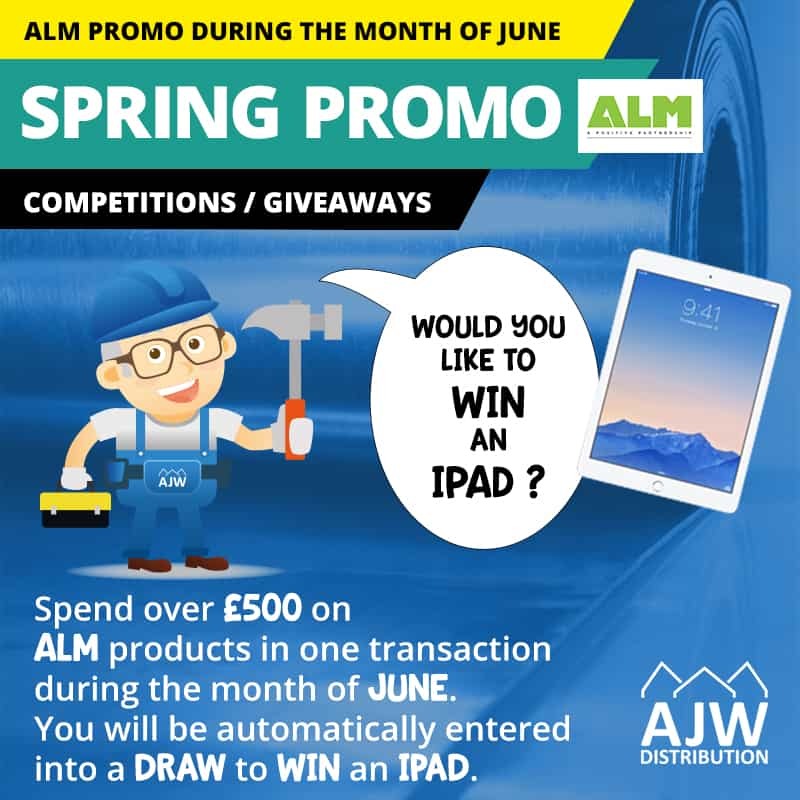 For JUNE ONLY: Spend over £500 in one transaction on ALM Products in any of our depots during the month of JUNE and you will be automatically entered into a draw to win an iPad. We will be announcing two winners through-out this promotion. One will be announced in May and the other in July. There are 2 iPad tablets up for grabs during our Spring Promotion.